Just in time for Super Bowl Sunday, I thought I’d post our favorite party dip. This is actually my Main Taste Tester’s recipe. Although I wasn’t sure about it the first time I saw the ingredient lineup, I have to admit the result is delicious. He fries up some ground beef with onion and spices, mixes it with a creamy, spicy cheese sauce, sprinkles it with shredded cheese and then bakes it. It has been the cause of many a burned tastebud because no one can wait to try it fresh and bubbling from the oven. We make this often for parties, particularly sporting events and everyone goes nuts over it, particularly the men. We are always left with an empty dish and a recipe request or two. If you are looking for a super healthy, from scratch recipe, move along. I will say though that this one is worth breaking the rules for. In a large skillet over medium heat, sauté onions and garlic in a drizzle of olive oil until softened. Add ground beef and cook through until browned. Add taco seasoning and hot sauce and mix well. Pour jars of cheese sauce into 9×13 glass baking dish. Add beef mixture and stir well. 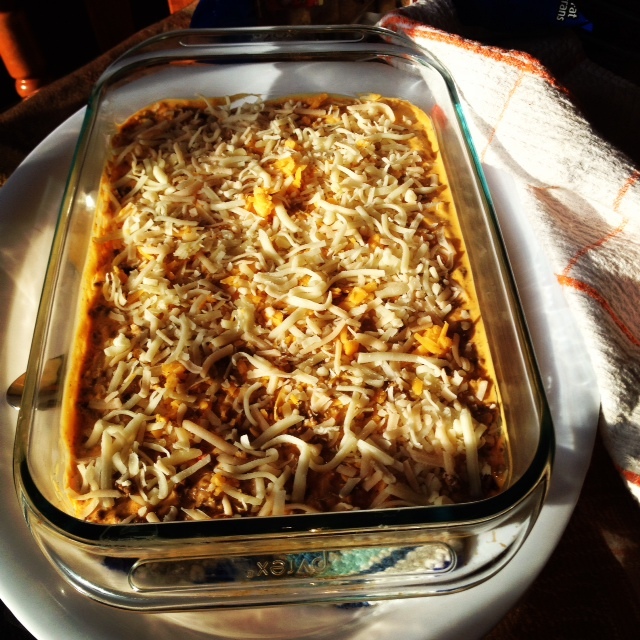 Sprinkle with cheese and bake for 10-15 minutes until bubbling and cheese on top is browned. Serve with chips!